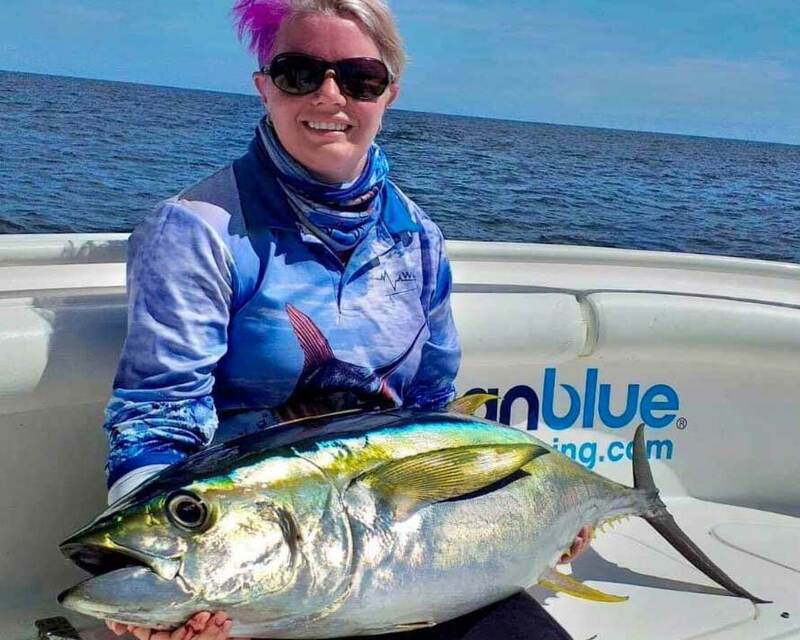 Planning for this trip started last February when my brother, Louis, saw an article in Marlin Magazine by a local fishing charter business called, Ocean Blue Fishing Adventures. The article mentioned that two grander blue marlin had been caught the previous season, so Louis fired off an e-mail to Ocean Blue to get more information. 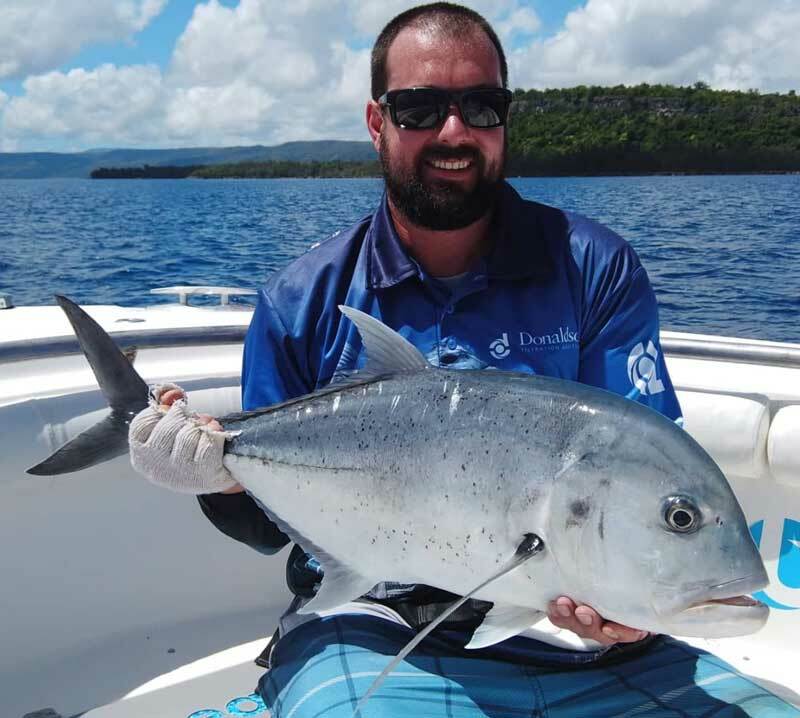 It wasn’t long until Louis and Anthony Pisano, who handles the sales and marketing out of their Sydney office, were in communication regarding the fishing in Vanuatu. The following 6-minute movie is a slide show and is in two parts. The first part is a summary of our daily fishing aboard the Ymer. It begins with our arrival, followed by Louis’s marlin on day 1, sunrise on day 2 and my wahoo, day 3 with the skipjack and finally the day I fished alone and caught 4 marlin, 3 yellowfin tuna, and 2 dorado. It ends with a view of the Ymer returning to the marina with flags waving. Over the months, Louis did a lot of research on the fishing seasons, catch rates and of course, hotels and infrastructure there. Anthony was a big help in pointing our way to information on the fishing history of that area and also the best time of the year to fish it. 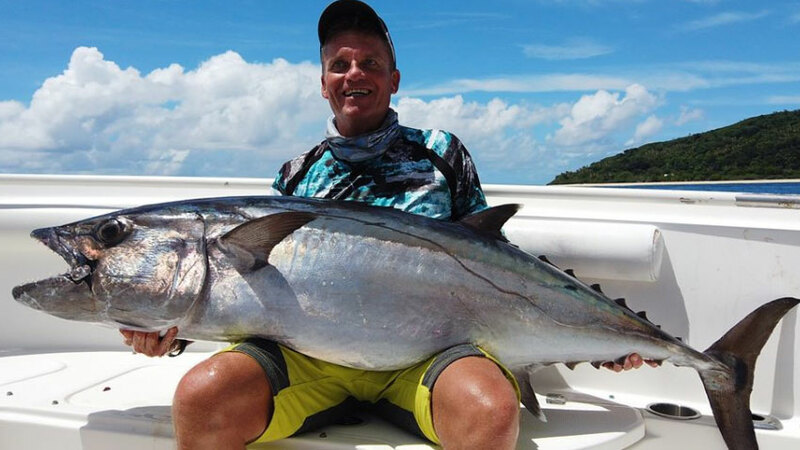 The plan was to go in early October and fish 3 days on the Ymer with captain Remy Frouin, with the remaining 4 days to see the island and do some surf fishing. Anthony supplied us with a link regarding the fishing in this area that really got our feathers ruffled up. After tying the boat up, Remy came over and joined us. We talked about the schedule for the next morning and agreed to a time to meet. I would need some extra time to set up my laptop and GPS, I told him. Remy said the crew would be happy to assist me with that first thing in the morning. We had hoped to meet the crew this evening, but the crew coming off was scheduled for some time off, so we wouldn’t be able to meet our crew until the next morning. We all agreed to meet at 5:00 AM with a departure by 5:30 AM. Just as we were finishing up our meeting, it started to rain. It was raining in Seattle when we left and here we are 8,000 miles from home and we find rain again. Yuk. Remy told us that a low-pressure system had moved in this afternoon, but it wasn’t expected to have much rain with it, but it might be a little windy at times. Just before we all left, I looked at Remy and I asked where he came up with that name Ymer for the boat? He replied, “I asked my 10-year-old daughter for a suggestion, and she said, well, Ymer is Remy spelled backwards, why not name it that”? Our first morning, we awoke to a partly cloudy sky, a bit humid with temperatures in the lower 70’s. When we got to the boat, Remy and the crew greeted us: Jean-Luc Cassart (Nono) and Sandy Sur. Nono also fills in as captain when Remy needs his days off. Nono would be the leader man and Sandy was the tag man and cook. While Louis and the crew discussed the arrangement of gear, I connected my laptop and GPS and immediately started getting GPS coordinates on the chart that I had scanned. Louis had put one of our 50-wides on the side of the chair and the boats 80-wide on the other side, which would run on two flat lines short. Then the 2 130’s went on the longs with our other 50-wide running off the stinger. All of the tackle was in top condition. The 130’s all had fresh line, lures had new leaders, and the hooks were sharp. The boat itself was also in top condition. The fighting chair was also very high quality. I did notice however that there wasn’t a live-bait tank or tuna tubes. Remy said that they rarely use rigged baits and only seldom do they use tuna tubes. The head was small but clean and functional. We headed out of the marina right on time. It was just a 10-minute run to the harbor buoy, and then Remy put the power on. Nice smooth ride and looking at the GPS I could see we were doing 26 knots on a southwest heading. The run to open water from the marina and Mélé Bay took about 40 minutes. As we rounded Matao Tiupeniu Point (Devils Point), we headed west to what is called the marlin highway which runs adjacent to the lee side of the island. Another 10 minutes and we were slowing down and putting the lures out. The bottom drops off rapidly and we were already in 100 to 200 meter deep water less than a half mile from the shoreline. Just after the crew put the lines out, Sandy brought us some delicious croissants and fresh orange juice. That really hit the spot, as I always get my hunger up when I smell the ocean air. The wind had picked up considerably since we left Mélé Bay. The swells were also rolling in now from the east to west, with a large chop from the trade winds. The lures were constantly popping out and the lines began popping out of the riggers every 10 minutes or so. They rigged them with rubber bands in the clips, but these would break quite easily. Remy told us that the low-pressure system that moved in last night was responsible for these less than ideal conditions. We saw a lot of birds just about anywhere you looked, but they were not concentrating on any particular location. With the sun higher in the sky now, you could begin to see the deep clear azure color of the water. It was crystal clear. Un-like fishing in Cabo, the VHF radio was silent and there were no boats to be seen. From the track you can see that we traveled almost 35 miles, past Erétoka Island, called Hat Island by the locals, past Lélépa Island then north of Moso Island and then just west of Nguna Island. This is the area known as marlin highway. That was quite a long trip without any bites I thought. We then headed southwest to a spot where there are two seamounts. Not much luck there either, so we headed south again plowing back down marlin highway. Not much traffic on this highway today, I thought. Sandy served up some outstanding chicken sandwiches, made like a sub with locally grown lettuce, tomatoes and onions. They were great. ever left home so Louis would take the first billfish. All at once, everyone sprang into action. Louis quickly got into his stand-up gear while Nono and Sandy cleared the remaining lines. Remy had hit the throttles with perfect timing and the fish was well-hooked and peeling off line. Then Nono pointed to the jumping blue off in the distance. The wind and chop was really bad by now because we had lost the cover from the main island and we were now in the main line of the 20-knot trade winds. The swells also had been getting bigger all day and we were now experiencing some 8-10 foot rollers. This was making it difficult for me to get any video not only because it was hard to stand-up but also I was getting too much spray on the lens. I was able to get a few shots of the blue jumping. All this time Louis was working the fish trying to get line back. He was really having a tough time, again because of the rough conditions. 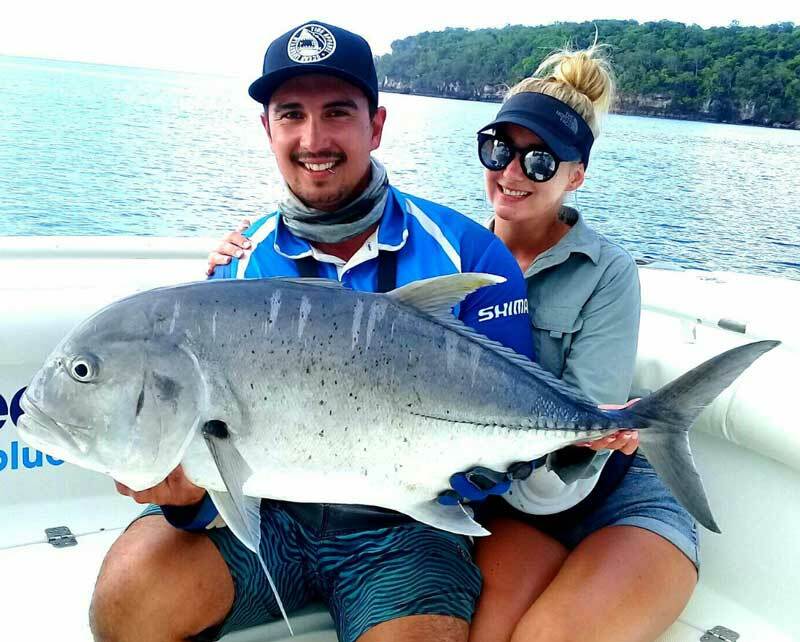 I doubt that at the time, neither of us were even thinking or were aware of the rough conditions; we were simply too excited about fighting our first south pacific blue marlin. In about 15 minutes or so, the angle on the fish was about 45 degrees, so Louis had gotten back most of the line by then. This is when the trouble started. 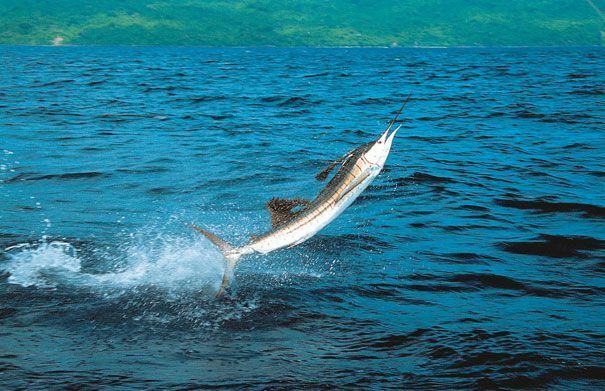 Louis had widened the spread on his feet, but he was clearly having problems with the boat rising and falling so quickly in the swells coupled with the strong unpredictable runs of the marlin. It was clear by now that this wasn’t a perfect time to be doing stand-up fishing. All of a sudden, after peaking over a huge roller, the boat dropped like a rock, and at the exact same time, the blue charged the boat, and Louis went flying backwards because of the sudden loss of tension in the line.Nono and Sandy, who were standing right next to him, quickly gave aid and in a heartbeat he was standing back up with marlin still attached. Wow was that close! Nono and Sandy continued to help him keep his balance, but it was time to head for the chair on this one. With Louis now in the chair and able to really put the heat on, we had the marlin up to the leader in just a few more minutes. Nono grabbed the leader and Sandy delivered the tag. After a short revival and a few moments to video the fish along side, it was released unharmed. Nono estimated the weight at 280 lbs, which is what I entered into my log. Total fighting time was just over 40-minutes, but it seemed like only 5-minutes. We probably spent more time congratulating each other over our success than we actually spent fighting the fish! But that is the best part, the handshaking, the smiles, the sense of achievement, teamwork; it’s all part of the game. By the time we had the lines back out, it was nearly 4:30 PM so our chances of scoring another blue today seemed doubtful. Our 10-hours of fishing was over at 3:30 PM about the time Louis got hooked up, but Remy continued to troll towards the entrance to Mélé Bay, about 10-miles away, in an attempt to get me hooked up rather than just pulling in the lines and heading in. As the entrance to Mélé Bay appeared, I realized that my day would have to be tomorrow, yet I was confident of the crew that I wouldn’t be disappointed. We finally backed into the slip at 6:02 PM, almost 13 hours later and with a tag and release flag flying we were all proud of. Pulling into the slip is a little bit of an afternoon thing for the local people and tourists enjoying their cocktail hour at the Waterfront Restaurant. All eyes turn to the boat as it backs in to see what they caught for the day. Remy’s wife, Janet, was again present to greet us, so we all gathered at a dinner table while Nono and Sandy prepared the boat for the next morning. We told Remy that we would like to meet at 6:00 AM the next morning instead of the earlier 5:00 AM since it appeared that the afternoon was the time of the most bites. We arrived on time at 6:00 AM and were underway at 6:15 AM. This morning we headed south of Mélé Bay instead of going west to marlin highway. We headed south from Pango Point, about 2 miles, then put out the lines, using the same setup as the day before. It was again rough conditions as this time we were directly in the path of the trade winds, which were blowing about 12 knots from the east. We trolled south until we were about 6 miles from the point, then headed east to parallel the south side of the island. We would be inside of the 1000-meter line, with a depth averaging 500 meters. At 8:13 AM Sandy and I simultaneously spotted a marlin in the spread going for the right short corner lure. The marlin apparently wasn’t hungry or we were just unlucky on that one. Remy circled the area to no avail. We continued trolling another 10 miles to the east until we reached the 200-meter contour line. From there we headed south again traveling another 10 miles before heading west. It was around noon when Sandy served up lunch. Chicken sandwiches again. Just as I sat down to take a bite, the left long got knocked down. Unfortunately, we new right away it wasn’t a marlin because it didn’t pull any drag. I was up, so I went to the chair and started cranking. 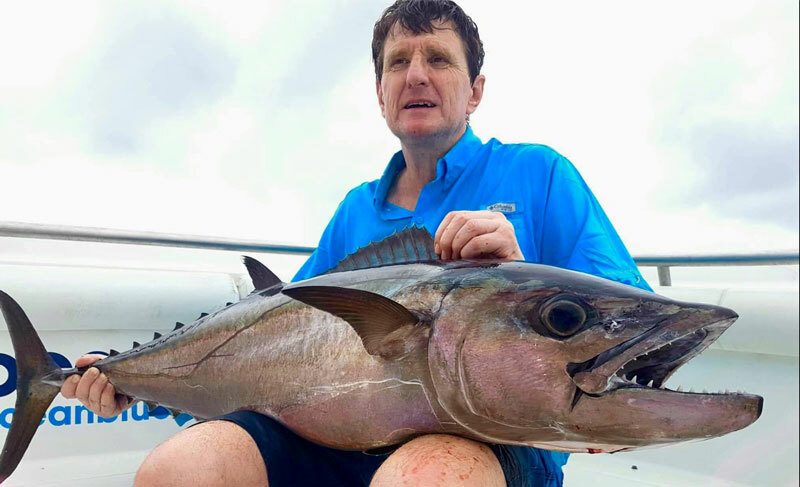 I could tell from the way the fish acted that it wasn’t a dorado – either, a wahoo or a small tuna I thought. In less than 5 minutes we had a nice 35-lb wahoo in the cooler for dinner, and I was back to eating my lunch. I spotted a small sandy beach situated amongst the otherwise volcanic shoreline, known as Narpow Point. I told Remy that I would like to get as close as possible to the surf so that I could use my surf rod and ranger lures to see if we could get any bites. Remy agreed and we were soon sitting just a few feet from the breakers in about 60 feet of water. The water was so clear that you could see the bottom as if it were only 10 feet deep. I broke out my 11-foot surf rod and spinning reel and put on the red and white ranger while the crew watched with curiosity as to what would happen next. I told Nono to pull in the right outrigger so I could get a full swing when casting. I took aim at a 45-degree angle from the boat and the beach and let it go. Everyone was amazed at how far I could throw that 4-oz ranger, at least 70-yards. With each cast the crew watched the ranger on the surface as I retrieved it. On the third cast, we saw a huge boil behind the lure as I was retrieving it just beyond the white water then the fish took the lure. No one had any idea what it was, but it was putting up a grand fight on the 20-lb test line and I was having a ball fighting it. After all, I had never done this before while fishing for marlin and I doubt that the crew had either. The calm conditions and the scenery of the palm tree lined island tempered the mood with no visible intrusion from humans. It was simply paradise. Soon the fish was at the boat and Nono reached over the side and brought it aboard. It was a bright red fish with large scales, weighing about 18-lbs, it looked similar to a red snapper that is common in Cabo. Thinking that it was, and knowing that snapper is great table fare, I asked Nono to keep it. Remy said no, because the fish is actually a red bass and is poisonous if eaten, so we tossed it back. Louis, watching all of this while running the video, now wanted his turn. The leader on the ranger was frayed a bit so he replaced the lure but used the blue and white ranger this time. Louis wasn’t as lucky as I was and soon gave up after about a half an hour. As I took the rod back from Louis, Nono looked as if he wanted to try this too, so I asked him if he wanted to try it. He said yes, but he wanted the red and white ranger, which gave us all a good laugh. Nono soon got the feel for casting and was doing a good job of getting the lure into the surf line. We were all having a great time and we did see more boils behind the lure but were unable to get hooked up again so we went back to trolling again, heading in a westerly direction parallel to the shore line. It was nearing late afternoon and as with yesterday, my hopes of getting a marlin began to diminish except for the thought that it was about this time yesterday that Louis got his marlin, so I was still hopeful. Today though, we had not seen many birds flying indicating that the bait had moved out of the area. Soon we were back to Pango Point where we had started in the morning when Remy said it was time to head in. We arrived at the dock at 4:30 PM with the lonely wahoo flag waving in the gentle breeze. We invited Remy and the crew to have a cold beer with us so Louis had the bartender put some on ice while we waited for Nono and Sandy to clean the boat up. After the boat was clean, Sandy brought out the wahoo and cut off several huge steaks and gave them to the cook for our dinner later that evening. Since we only had one day of fishing left to get me my marlin, I asked Remy what he planned on doing tomorrow. Remy and Nono suggested that our best bet would be to go back to marlin highway and work the same area we did the first day because of the lack of birds and bait sightings on the south side of the island today. We agreed and set a departure time of 5:00 AM again to maximize the time on the water for the last day. Louis and I had a few more cocktails and then asked the cook to put our fish on the grill for our dinner. The cook told us he would prepare the fish with two different methods, both being grilled but using a different sauce. When the fish was done, it was served on two large platters. We were each giving a plate with rice, fresh broccoli, steamed carrots and a basket of freshly baked bread. The sauces were a simple garlic and oil and the other was a heavy coconut crème based with cilantro and red peppers. Both sauces were outstanding and the fish was cooked to perfection. We departed at 5:17 AM for our final day of fishing. As with the first day, when we neared the outside of Mélé Bay the wind and swells had grown larger making it difficult to keep the lures in the water. Also, it wasn’t long before we saw birds working the area just off the point again. Sure enough, Remy soon spotted a huge school of skipjack with birds crashing into them feeding on the anchovies that the skipjack forced to the surface. It was about 6:20 AM when we got the first bite, but it was a skipjack. 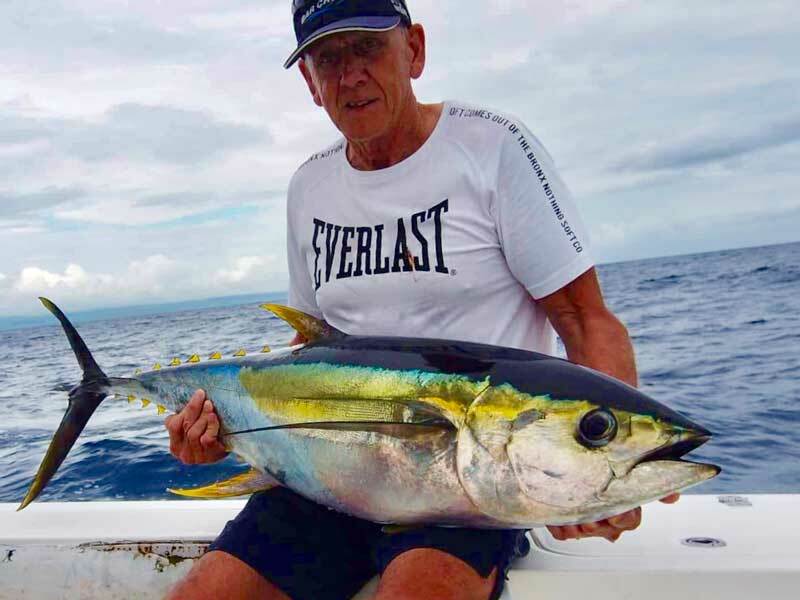 Louis took the rod and quickly brought in the estimated 15-lb skipjack. I asked Nono to rig the skipjack up but then we all agreed that are best opportunity would be to continue trolling around the school to cover more ground. The school soon disappeared so we headed north towards Hat Island and the west side of the island as we did the first day. Having 2 trips behind us, it was almost as if we had been fishing with these guys for years. We were always joking around and having a great time together as if we were long time friends. Just before I left on this trip, I had played one of the many games on the Internet that was aimed at “getting Bin Laden”. In one game, the object was to shoot Bin Laden who had taken an American hostage in a liquor store. As he would pop up from behind the counter, you were to shoot using your mouse, getting points for a hit, and losing points if you shot the hostage by mistake. Occasionally, you could hear bin laden say “I kill you”. I gave the link to Louis also, so we both picked up that term “I kill you” and we were both using it all along on the previous 2 days. When I explained all this to Nono and Sandy, they all laughed and started using the phrase too. After an overcast morning, the sky cleared up as we neared Hat Island around 9:30 AM. We were much closer to the island this time and we could see the surf pounding in on the southern tip of the island. We were less than a mile from the island, trolling the steep contours where the depth ranges from less than 80 meters to more than 300 meters in just a short distance. As I was trying to get some video of the island, my hat flew overboard – my lucky hat that I wore when we got the grander in Madeira 2 years ago. I thought, heck, it hasn’t been all that lucky on this trip so maybe that’s where it belongs. Sandy quickly says, “I kill you”! We all started laughing while Remy turned around to fetch the hat. After a few unsuccessful attempts to grab it with the gaff, Sandy jumped over and retrieved it for me, all the time yelling, “I kill you”. It was hysterical, but you had to be there to understand the humor in it. Lunch came again around noon and we were now in the area where the two seamounts were located. Sandy served up the subs again, and when I took the first bite, I noticed there was no meat in the sandwich. I looked at Louis and he too had discovered that the meat was missing. We looked at Sandy and he had a big grin on his face and he yelled, “I fool you”, to which Louis and I replied back “I kill you”! We were really having fun despite the lack of marlin. The day ended up being one of a long boat ride, other than the brief excitement of the school of skipjack early that morning. But we did have some great conversations with Remy and the crew about how they got started, where they were from, and about their families. We also talked about the best time of the year to fish Vanuatu because Louis and I had already decided that we would return. We arrived back at the dock at 4:17 PM, again with a lonely flag depicting our single skipjack for the day. I was a bit disappointed that I didn’t get my marlin release and that we didn’t have more shots at one, but all in all we had a great time these past 3 days and developed new friendships. We sat down at the table for a final toast to the 3 days of fishing and all the fun we had. Remy sensed my disappointment, despite the fact that I was trying to hide it, and gave us his schedule for the following week: Tomorrow, the 14th, he had a one-day charter on the Ymer, an opening on the 15th, a crew day off on the 16th, a charter on the 17th, then two open days, followed by a charter on the 20th, and finally a 6-day live aboard leaving on the 23rd. Louis and I were scheduled to leave on the 17th so it looked like we could make that trip on the 15th and still have time to rent a car and drive around the island looking for some spots to do some surf fishing. Without committing one way or the other, we just left it as an open item.